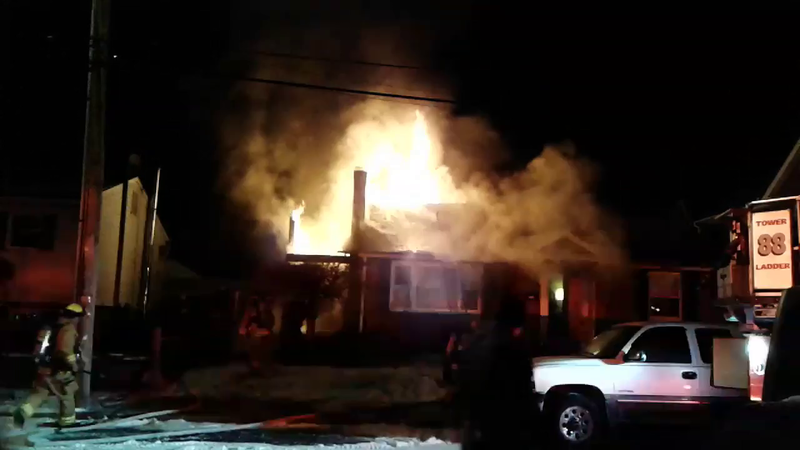 A fire struck a home at 101 N. Pine St., Middletown, early Wednesday morning, Jan. 3. Damage to the side and rear of this residence in the 100 block of North Pine Street is evident following a fire that broke out at about 1:30 a.m. on Wednesday, Jan. 3. The roof collapsed in the back corner of the house, fire officials said. No one was hurt but two pet dogs were taken to an animal clinic following a fire at a house in the 100 block of North Pine Street in Middletown which broke out shortly after 1:30 a.m. Wednesday, Jan. 3. The owners of the house had tried to fight the fire with a home extinguisher before firefighters arrived, Middletown Fire Chief Kenton Whitebread Jr. told the Press & Journal. The homeowner ran back inside the residence to try and find the dogs, but could not locate them and exited the structure, according to a post on the Middletown Volunteer Fire Department Facebook page. Firefighters located the dogs, both Labrador retrievers, and were able to get them out safely. One of the dogs had suffered smoke inhalation and was given oxygen at the scene by South Central Emergency Medical Services, Whitebread said. Both of the dogs were taken to an emergency vet clinic and are expected to make a full recovery, according to the fire company Facebook post. The residents are staying with other family members in the area, Whitebread said. Firefighters arrived at the scene to see fire coming through the roof of the residence. The roof collapsed in the back corner of the house, Whitebread said. Whitebread declined to speculate on the cause of the fire, saying that it is being investigated by the Dauphin County fire marshal under the district attorney’s office. This makes three serious house fires in Middletown within the past two weeks. Seven people were made homeless by a fire that occurred in a row of townhouses Dec. 20 in the 3100 block of Pineford Drive. That fire is also being investigated by the fire marshal, although fire officials have said the blaze may have been the result of a problem with a furnace in one of the units. On Dec. 26, fire broke out in the basement of a home at Grant and Colfax street. The homeowner was not in the residence at the time, and that fire is also under investigation. The continuing cold snap has made things more challenging for firefighters, Whitebread said. With the wind chill temperatures stayed below zero — from -2 to -4 degrees — during the entire time that firefighters were battling this morning’s blaze on North Pine Street, Whitebread said. Water froze almost immediately, and the street right in front of the house was still a sheet of ice as of this morning. Firefighters had a bag of salt to spread salt around the fire engine during the fire, and members of the borough’s Public Works crew showed up to spread more salt in the area after the fire. Firefighters brought with them to the scene extra clothing such as gloves and handwarmers. Gloves that had become nothing but “a block of ice” were brought inside Whitebread’s command vehicle to try and thaw them out, the chief said. The heat was kept running inside the fire engine, and firefighters were rotated in and out every 20 to 30 minutes to keep them from getting too cold. The chief urged that anyone with a chimney make sure that the furnace flue on the roof is kept clear of snow and ice this time of year. Otherwise, the exhaust could be blocked which can lead to a build-up of carbon monoxide. Whitebread also strongly advised that any homeowner resist the temptation to go back inside a house that is on fire, for any reason.